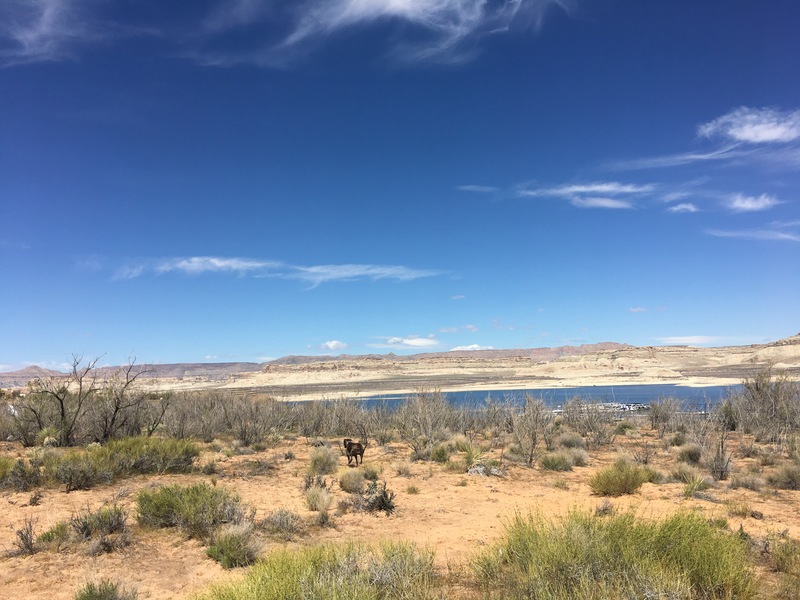 Kanab, Lake Powell, and the Mystery of Time – Neales…on wheels! 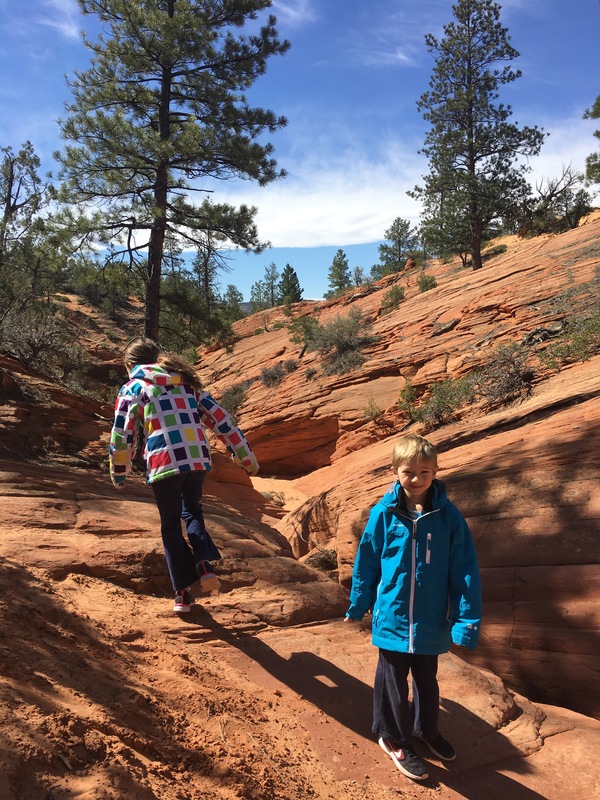 We spent a wonderful week in Kanab, Utah. 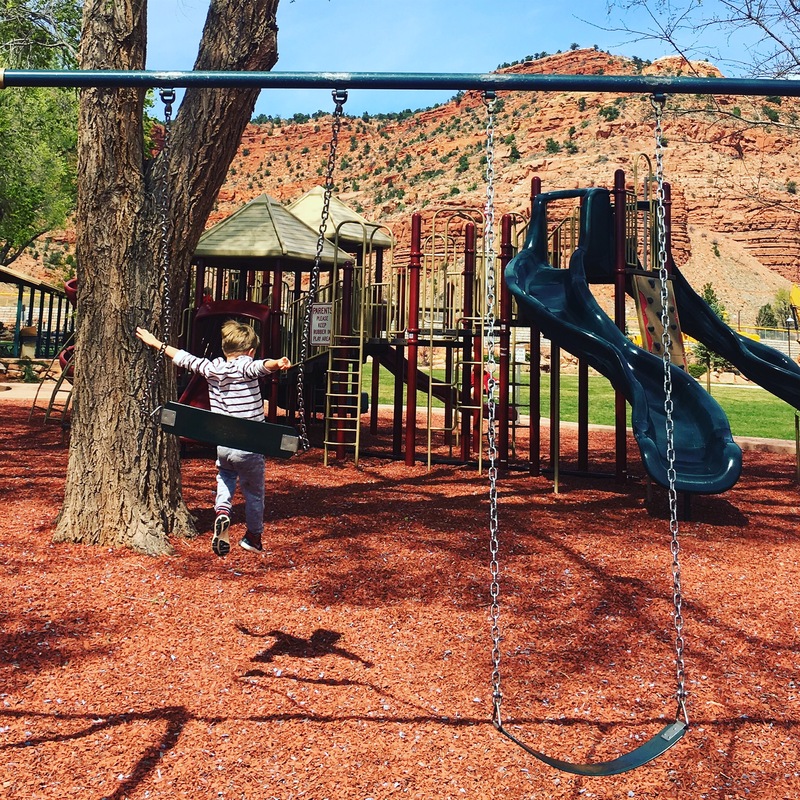 Generally considered a stopover point between the National Parks of Northern Arizona and Southern Utah, we found Kanab to be a small town with a lot to offer: gorgeous scenery, friendly residents, great food, and access to amazing outdoor opportunities, not even counting the National Parks. We could easily have spent another week exploring the area and enjoying the amenities in town. 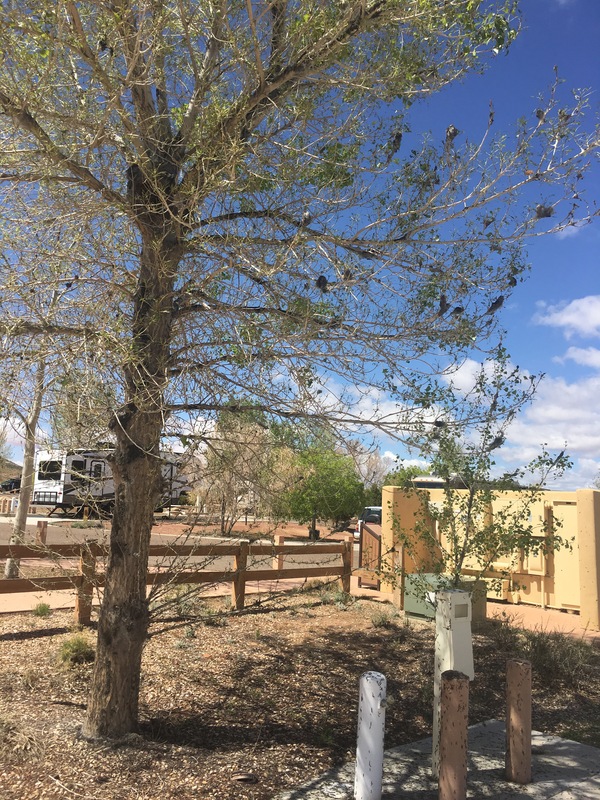 Nice place to walk the dogs behind our campground, the Kanab RV Corral. 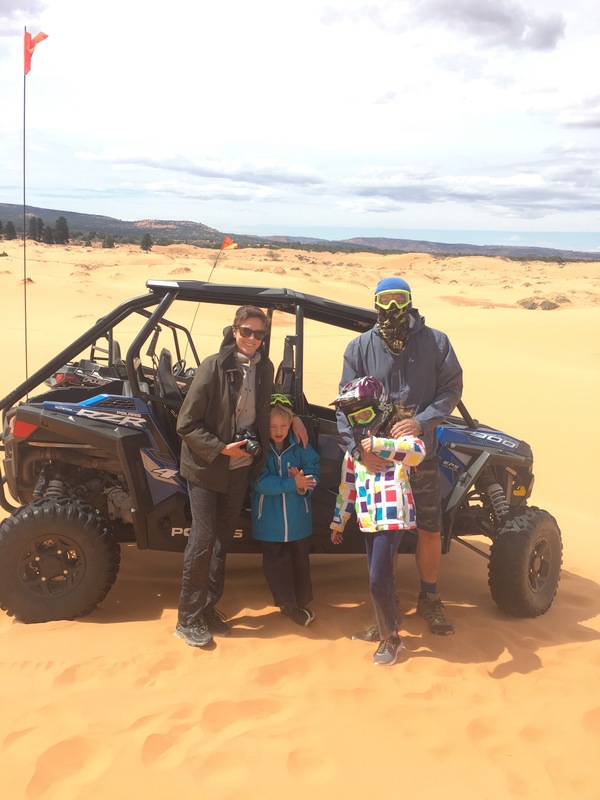 The highlight of our visit, and one of the best experiences overall since hitting the road, was taking an OHV (off highway vehicle) tour of Coral Pink Sand Dunes State Park. The dunes really are an orange-pink hue, and appear suddenly and dramatically out of the surrounding sage and juniper scrubland. The visitor center has a Utah State Park Junior Ranger program, a really cool collection of sand from all over the world, and outside, a viewing platform and nature walk. You can walk out into the dunes, and rent “sandboards” to slide down the hills. 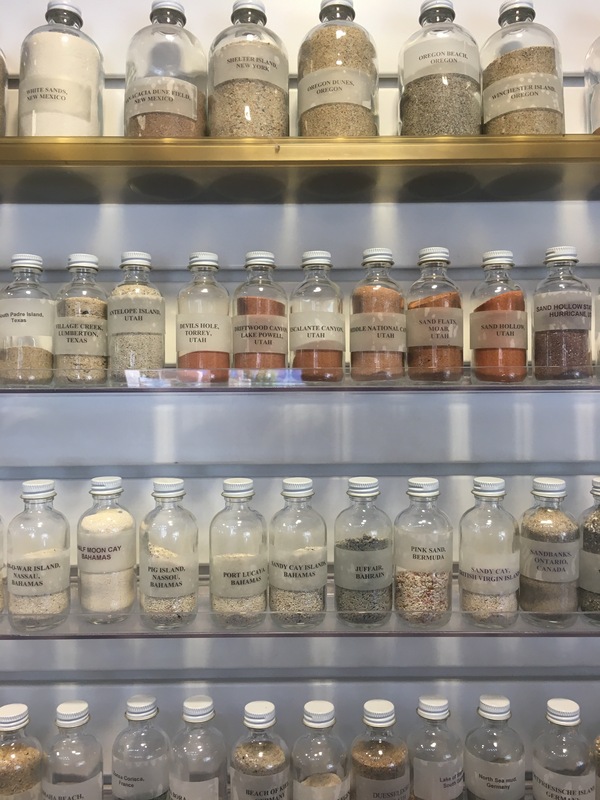 I loved all the different sands from around the world – and hometown friends check out Shelter Island on the top shelf! For our time with Coral Pink ATV Tours, Chris got to drive us in a 4-seater and our two amazing guides, Cody and Tiffany, drove their own vehicles in front and behind us. 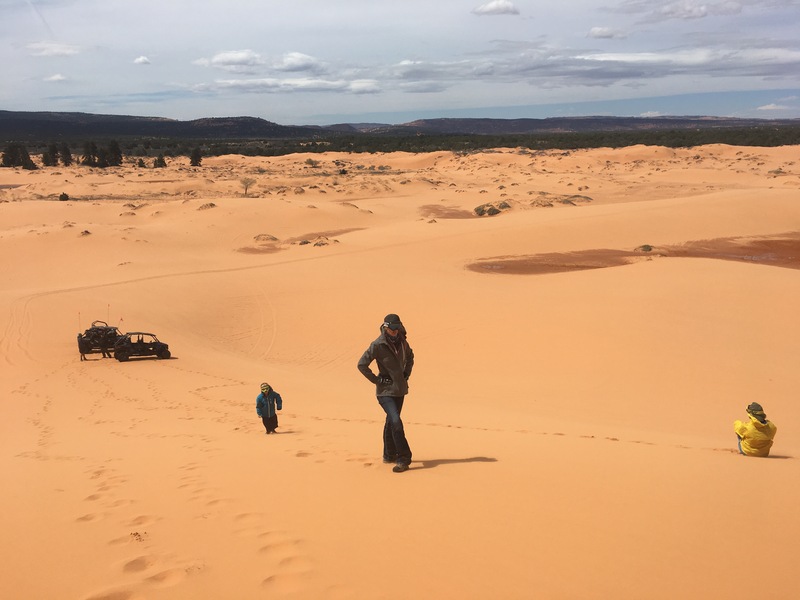 It was clear from the beginning that if we had rented our own OHV it would have been a fun experience, but nothing like traveling along with guides who clearly know and love the area so well and could take us to places we would never have found on our own. 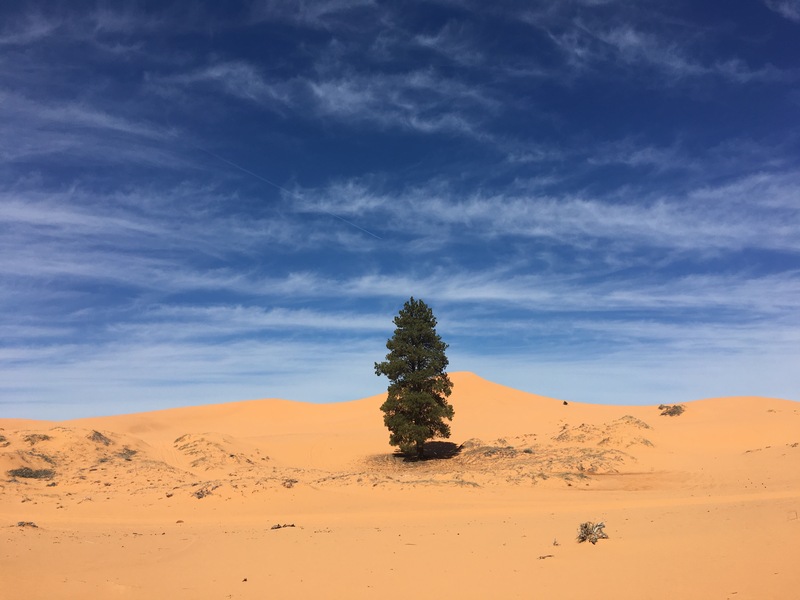 The four of us had a blast driving up and down and around the dunes, exploring a mini slot canyon, hiking to the top of the tallest dune, and seeing dinosaur tracks. 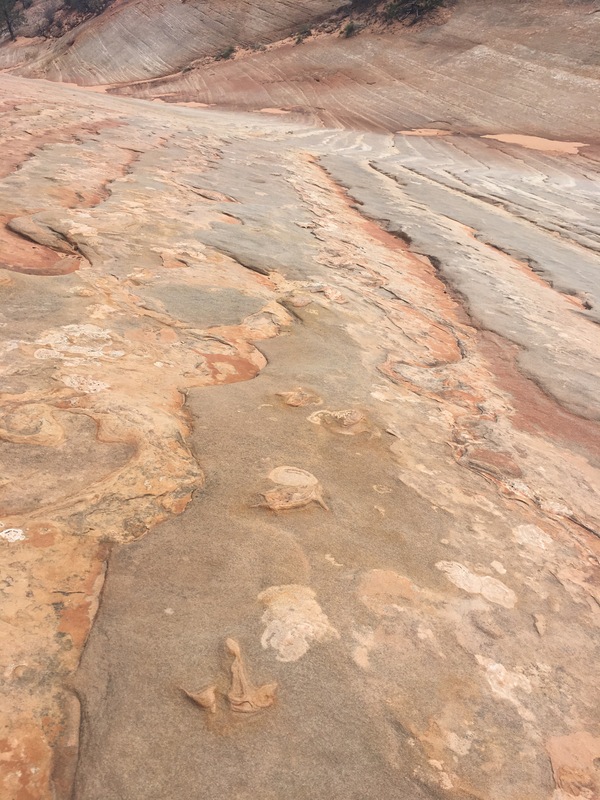 Charlie was more interested in running up and down the rock walls, but I was totally thrilled to get to see footprints right where they had been left by dinosaurs millions of years ago. We were at one of the most diversified collections of prehistoric animal footprints in North America, and had it all to ourselves. Seriously, this experience has been a highlight of our travels. Thank you, Coral Pink ATV Tours! The sand is compacted with each footstep and the surrounding sand eventually eroded away, exposing the prints. How cool is that?! The climb to the top was windy but worth it. Another unique place in Kanab is Best Friends Animal Sanctuary, the largest animal sanctuary in the US. We took the really interesting, fun, and free guided tour of the facilities in scenic Angel Canyon just outside of town. 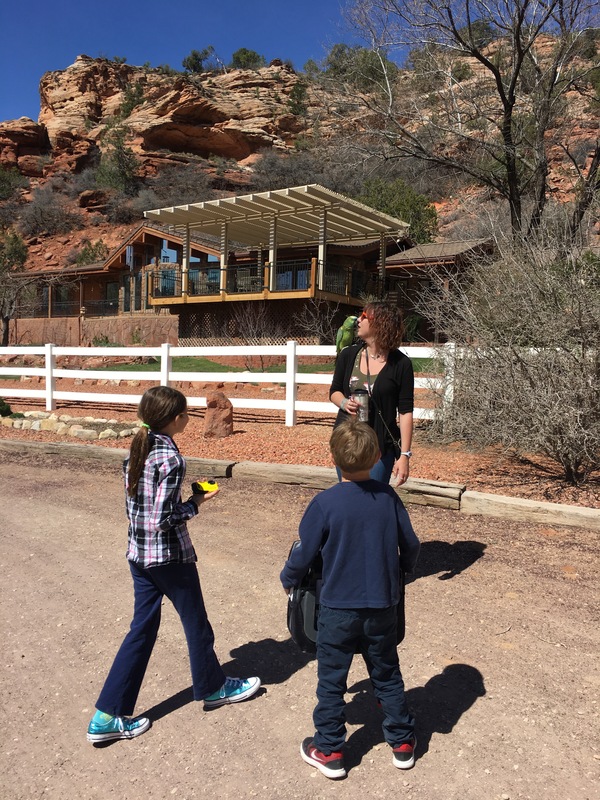 Best Friends’ modern visitor center is beautiful, the staff and volunteers welcoming, and they have maps available for great hikes in Angel Canyon. 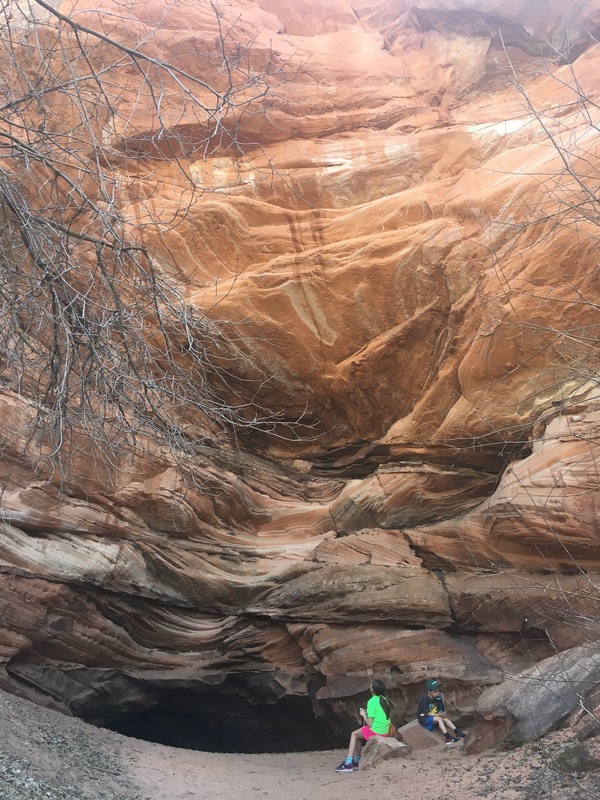 The 1.7 mile out-and-back Hidden Lake trail led to Anasazi ruins with pictographs in addition to an underground lake inside a cave. There was total darkness past the edge of the clear lake so we had no idea how big it was. The kids said it was spooky; I thought it was really cool. The kids loved our guide, and her parrot Captain Turkey. 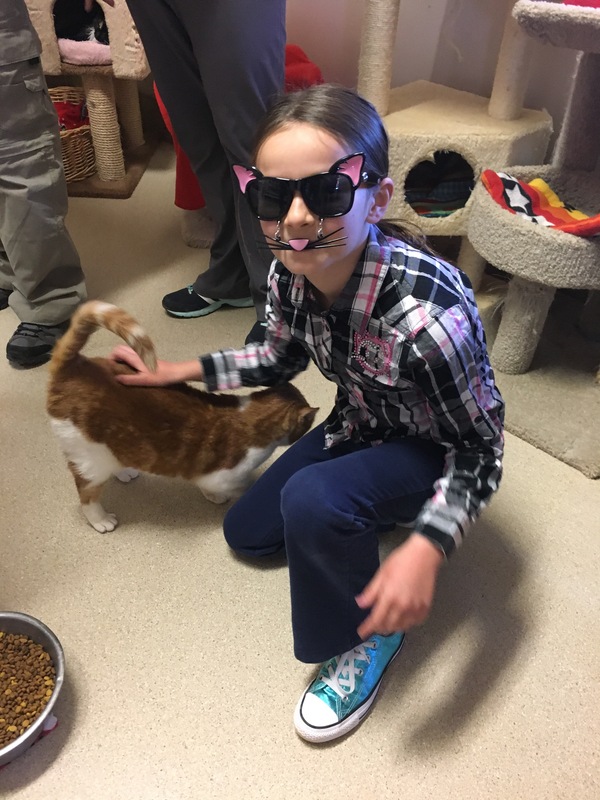 Cat sunglasses optional when visiting the cat sanctuary. This dramatic cliff is hidden behind brush, and a bottomless lake lies behind the mouth of that cave. Inclement weather kept us inside or close to home a couple days, but that gave us the opportunity to enjoy some spots in town. 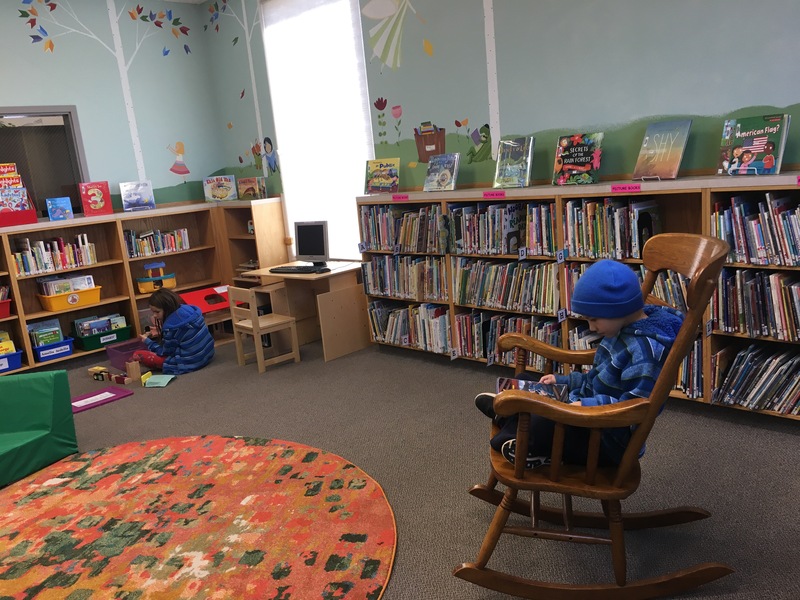 Kanab has a beautiful park and playground, and a cozy children’s room at the library. 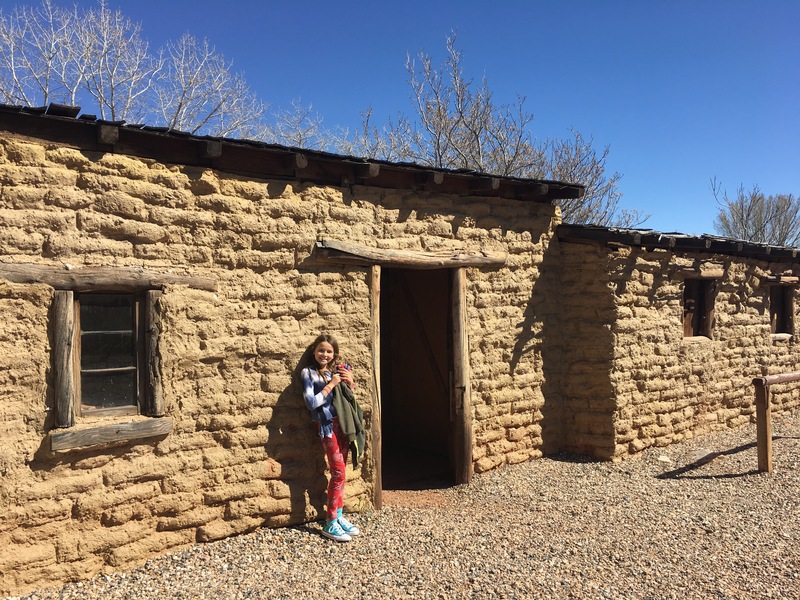 The Kanab and Grand Staircase-Escalante National Monument visitor center includes an excellent interpretive center, and the Little Hollywood Museum is a fun place to visit with set pieces and props from some of the dozens of Westerns filmed in Kanab. 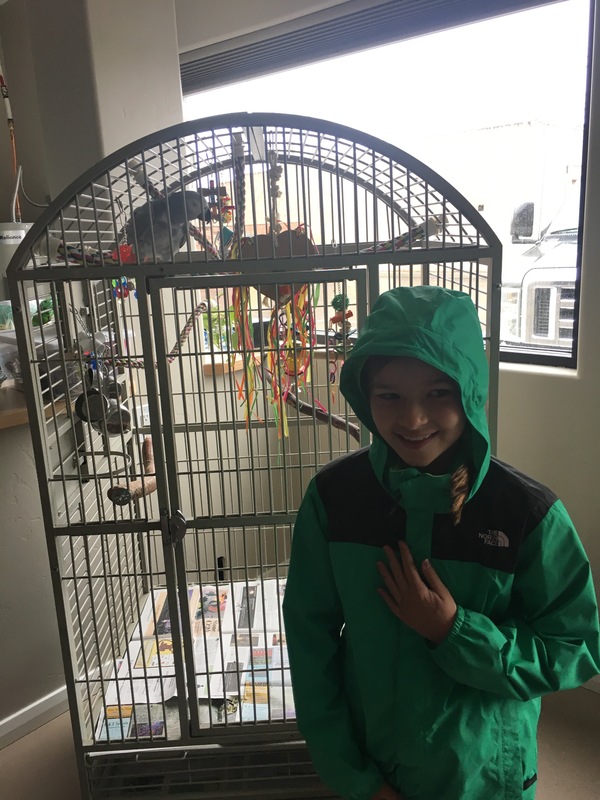 The kids loved spending time at Best Friends’ welcome center in town where they got to hang out with a couple cats and a parrot. Set from Clint Eastwood’s “The Outlaw Josey Wales” at the Little Hollywood Museum. 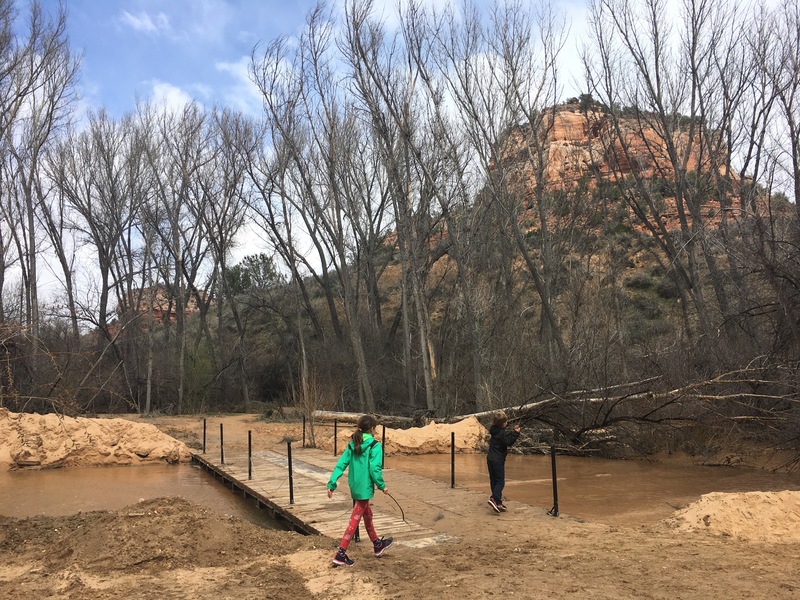 Back at Best Friends and Angel Canyon, Rita and Charlie had a blast throwing sticks in the flowing water to try to build a dam. 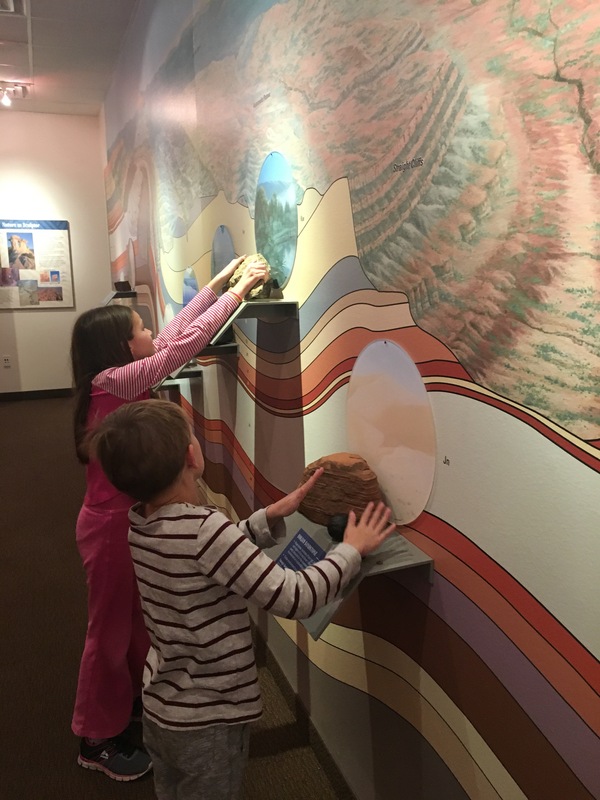 Wonderful display illustrating the geology of the Grand Staircase at the National Monument visitor center. Rita could have spent all day with Shell at the Best Friends welcome center. I mentioned food. 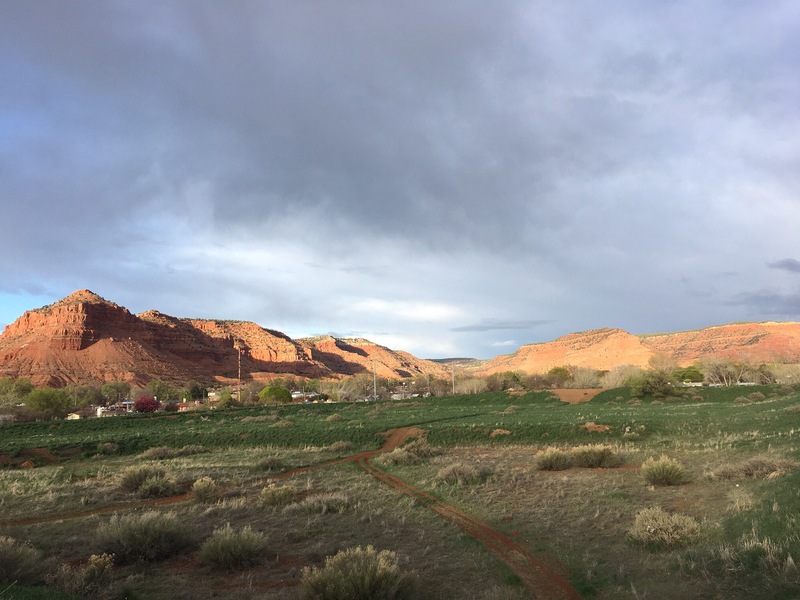 For such a small town Kanab really had an excellent variety of independent restaurants, from inexpensive burgers and Mexican, to slow-food-and-art and an amazing bakery. It wasn’t just the restaurants. I have to say I’ve learned to not expect much from local grocery stores, but Glazier’s Market had a surprisingly great selection and prices. Chris also found a butcher shop that cut to order and was very reasonably priced. If we somehow still had our chest freezer we would have stocked up on pork chops and steak. 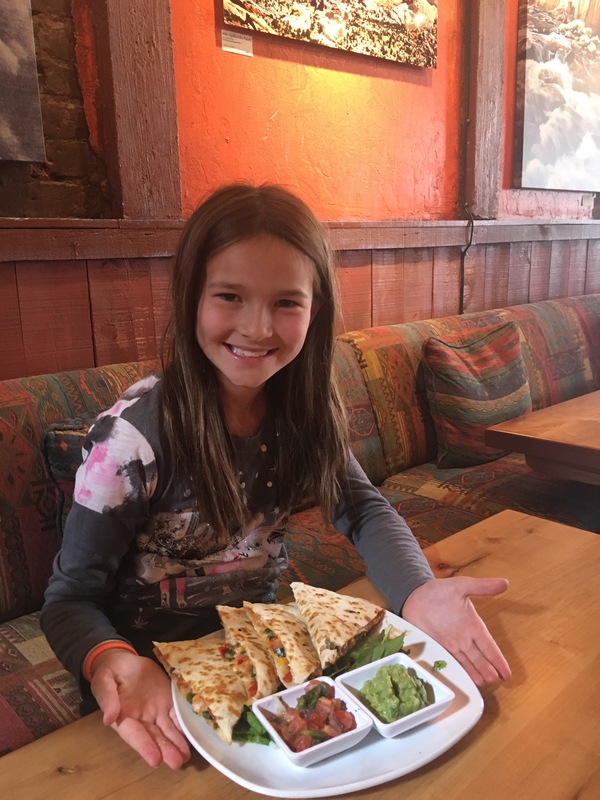 Rita and her shrimp quesadilla at the Rocking V Cafe. 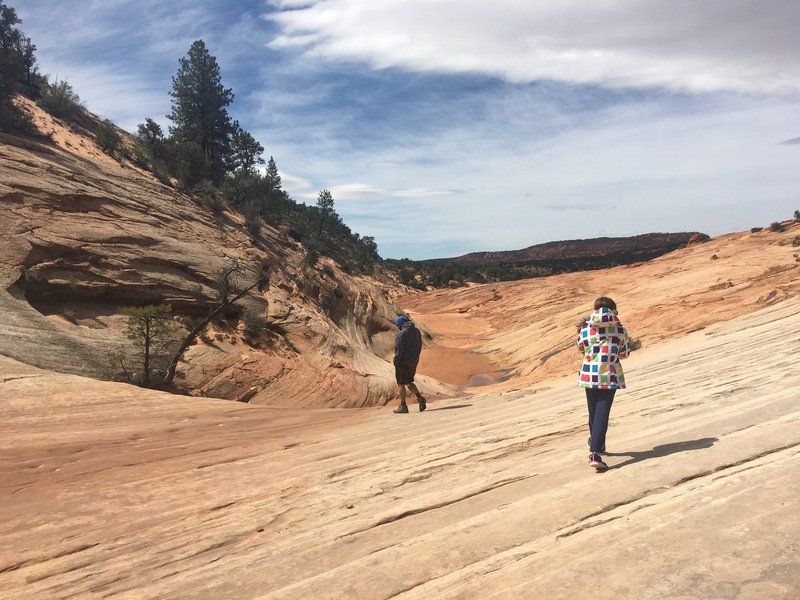 We left Kanab behind, hoping one day to return and explore the places we missed like White Pocket, Peek-a-Boo Canyon, and the world famous Wave. We tried to stop at The Toadstools on our way out of town, but the trailhead parking lot was too full for the rig. 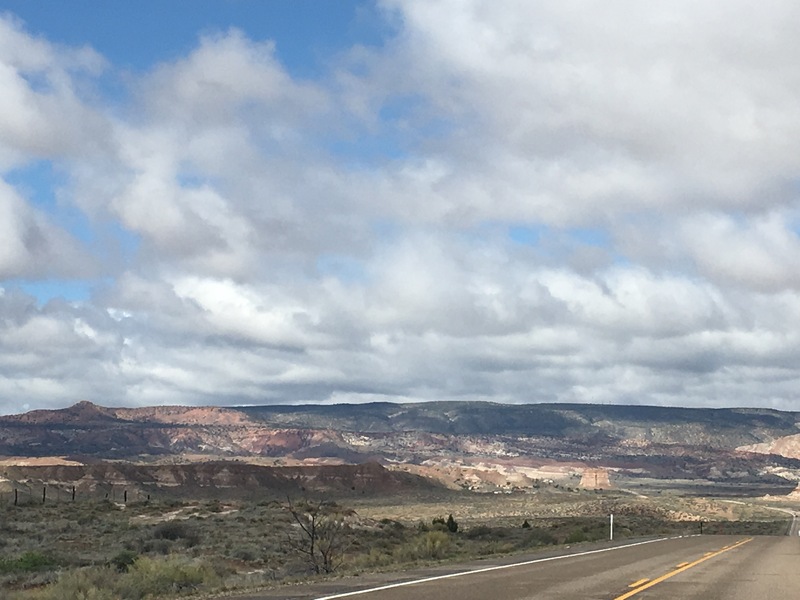 Still, the drive along Route 89 was gorgeous, running along the edge of Grand Staircase-Escalante National Monument (which, by the way, is 1.9 million acres – the largest National Monument, and roughly the size of Delaware). I would have had a lot of pictures from the drive to Page if I wasn’t driving the tow car. Rita got this shot. Our campground spot was in Arizona, outside the town of Page, but only a few dozen yards from the border of Utah. And we arrived about a week after daylight savings went into effect. Our poor cell phones were so confused, and kept switching between time zones. That first afternoon our two phones showed different times, and I walked down to the camp store to confirm which was correct. My phone stayed mainly on AZ time, except in the mornings. Chris’ phone preferred UT time. 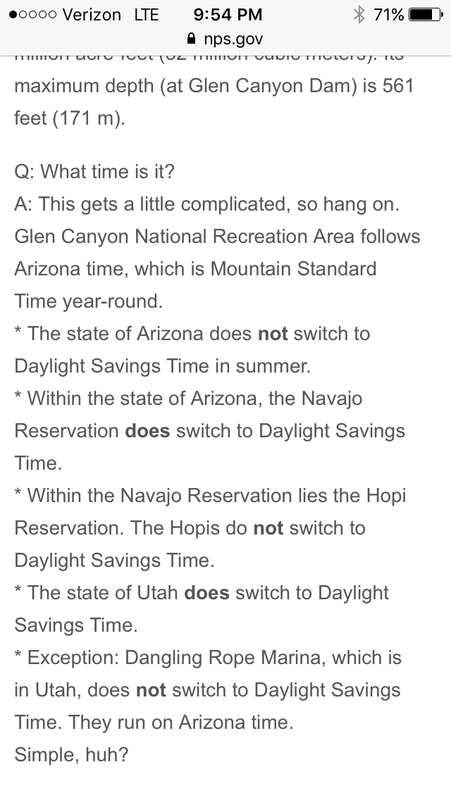 I found myself googling “what time is it in Arizona”, which felt absurd. Fortunately we didn’t have to be anywhere at a certain time – except for our Antelope Canyon tour, which is in the Navajo Nation but goes by AZ non-daylight savings time. We managed to wake up and make it to the check-in time at 7:40am, and then of course it was postponed. While Chris and I were puzzling over the time, and also enjoying our view of Lake Powell’s Wahweap Bay, the kids were busy creating a “habitat” out of a shoebox and leaves for the tent caterpillars that had apparently all just busted out of their tree tents and were swarming the campground. Ah, springtime. Caterpillars and their tents all over this campground scene. 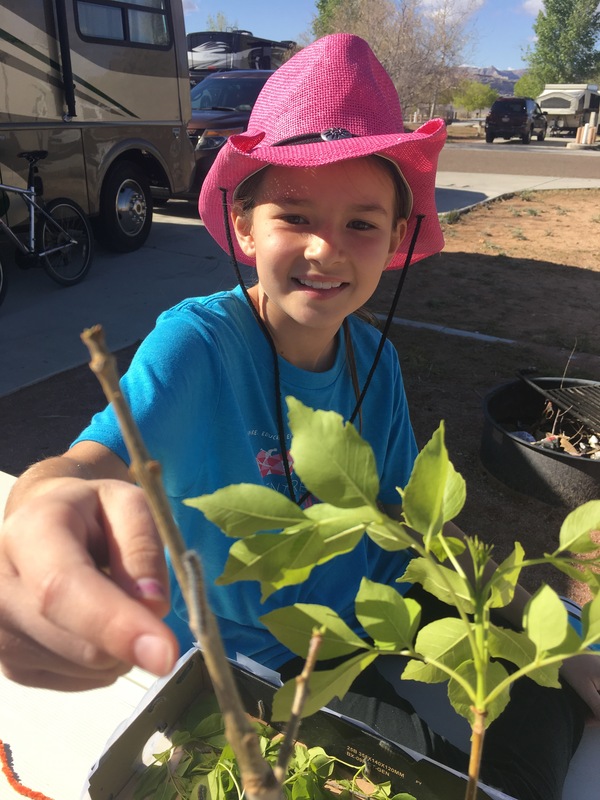 Rita and Charlie caught a fraction of the caterpillars crawling around, and they loved it. The dogs also enjoyed our campground for its multitude of jackrabbits. We were able to let them off leash in some isolated areas, and I’ve never seen Otis run so fast and so hard as when he caught sight of a jackrabbit. He gave a good chase, but was no match. Lake Powell is gorgeous, and it was wonderful to have a view of it from our campsite. We watched sunsets and rainstorms over the shoreline, mesas, and distant buttes. It was mesmerizing watching these storm clouds pass by. 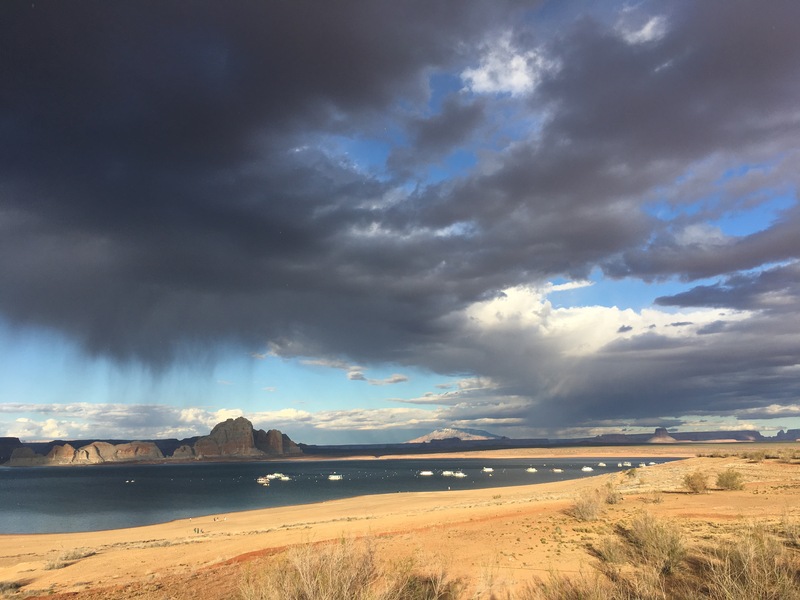 What we could see was only a fraction of Lake Powell: it’s 186 miles long and has almost 2,000 miles of shoreline – about the same as the West Coast of the US. Incredibly, no lake existed just 60 years ago. 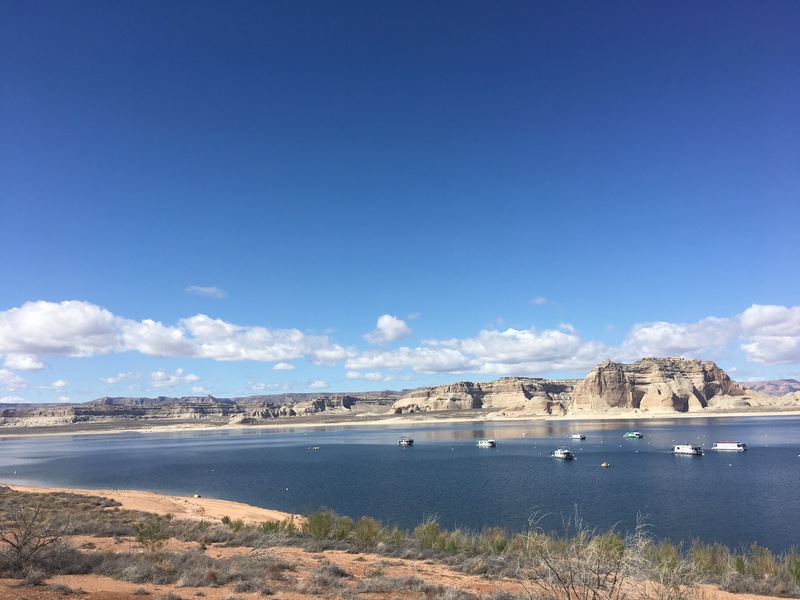 Lake Powell is a reservoir, formed by the flooding of Glen Canyon when the Glen Canyon Dam was built on the Colorado River between 1956 and 1963. 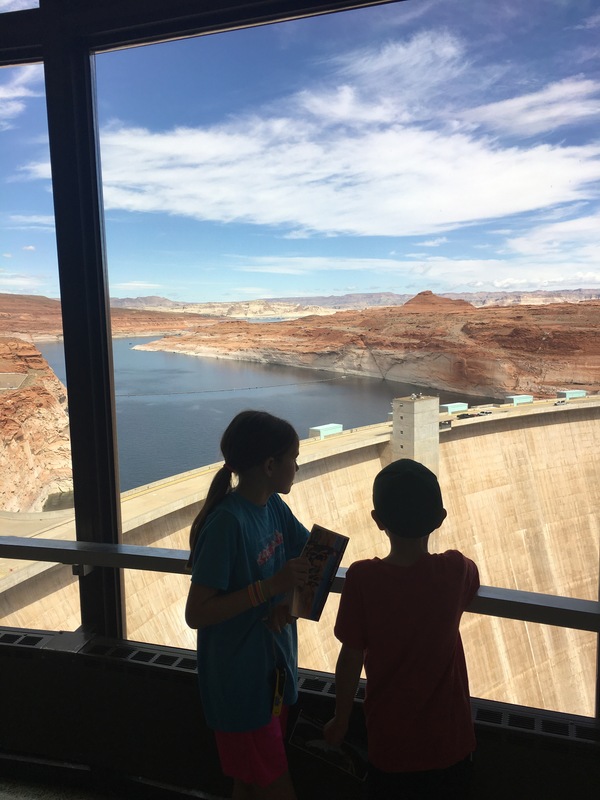 Glen Canyon National Recreation Area is an incredible place for outdoor adventures, from houseboating to backcountry hiking, and we certainly benefited from the water and energy produced by the Glen Canyon Dam as residents of Southern California. But it is hard to imagine today places like Canyonlands or Grand Canyon National Park being dammed up and flooded, and the Glen Canyon Dam was a catalyst for the modern environmental movement. This article gives a good overview of the controversy surrounding the dam’s history and questions about its future. Incredible photography and great stories! Really informative and really piques my interest for such a trip. Thank you so much, Maura! Would love to explore the area with you.